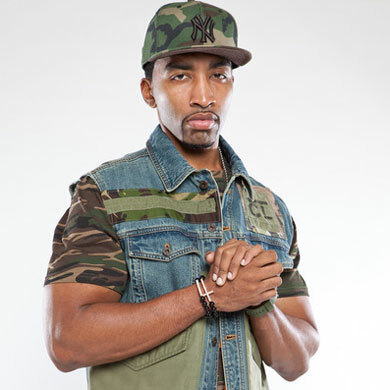 Mysonne, “the General” to his fans, is an independent hip hop artist and criminal justice reform activist from the Bronx, NY. Known for his introspective style, brutally honest and socially conscious lyrics, this experienced MC proves that struggle can be the catalyst for leadership. Music has helped Mysonne get through his darkest moments. He was forced to grow up fast when, at the age of 11, his father died. While his family found a loving home with his grandparents, outside was a treacherous, poverty-stricken world of drugs, gangs and violence. Mysonne kept himself out of trouble by pouring his energy into hip hop and his other love, basketball, competing in the Rucker Park Basketball leagues with future NBA stars like Allen Iverson, Stephon Marbury and Rafer “Skip To My Lou” Alston. In the 90s, Mysonne made a name for himself in the rap game, battling artists like Shyne and DMX and taking over the mix tape circuit. It seemed like Mysonne was on top of the world. He was appearing on magazine covers, he scored a major deal with the iconic record label, Def Jam and he became father to a son. Then, Mysonne was picked up for a line-up one day, and a witness misidentified him as the culprit in an armed robbery. Prosecutors offered him a plea deal: five years in prison. But Mysonne didn’t want to accept time for a crime he didn’t commit. He went to trial to prove his innocence, and ended up spending seven years in prison. For Mysonne, his experience compelled him to do more than rap about the social and economic conditions of the ghetto; he came back ready to make change. Mysonne is active in Just ice League NYC, organizing and speaking out against biased policing and inequity in the criminal justice system, and he supports the Women’s March by overseeing security for events including the 2017 Women’s March on Washington and the Women’s Convention in Detroit, MI. He has helped lead major demonstrations including the #March2Justice, which brought almost 100 people on foot almost 250 miles from Staten Island, NY to Washington, D.C., as well as the #NRA2DOJ march that called on both the National Rifle Association and the U.S. Department of Justice to take action on behalf of Philando Castile. Mysonne also mentors incarcerated youth through The Gathering for Justice, an organization founded by Harry Belafonte, helping young people discover their gifts and interests and develop the insight needed to return to society. Mysonne made the decision to start his own company, US Entertainment, to maintain creative control over his work and deliver the type of music that his fans want and need. In February 2017, his single “That’s How We On It” earned heavy rotation across the country, and sparked interest again as a summer remix by Fabolous, Raekwon and Dave East. Video of his 2017 freestyle on DJ Funkmaster Flex’s show reached over 40 million views. His highly popular Cypher on the 2017 BET Hip Hop Awards was likewise celebrated both for its technical skill and the socially conscious content. Mysonne’s numerous music collaborations include groundbreaking artists such as Chinx Drugz, Rick Ross, Pusha T, The Game, Cory Gunz, and Hopsin, amongst others. Mysonne represents the underdog, refusing to succumb to negativity. While his life has been full of struggle, those struggles have made him the man he is today and given him the power to lift up others in the fight for justice. Mysonne constantly shares his insight, strength and hustle through his music and public speaking, breaking the barriers society has placed on him and proving to the world that Mysonne “the General” will triumph against all odds. He is married to Angelic Linen and is the proud father of three sons.